Yes, I did it again! I went back to Hawaii a second time and watched another Pipeline contest on the North Shore. When I arrived at the Banzai Beach Park to watch the first day of the Pipe Pro, I was surprised to see that the winter swells had taken away pretty much all of the beach! Where we used to sit and watch the Pipe Masters on the beach in December there was now only raging waters left -definitely no place to sit and watch in awe. No wonder they have to run the Championship Tour event in December – they wouldn’t be able to fit all the spectators on the beach as small as it becomes in the end of January! Unfortunately, the quality of the waves in January could not compete with what I had seen I December, but it was still impressive to see the guys take on one of the scariest waves! And the many Hawaiians trying to get their first points to qualify for next year’s Championship tour didn’t make it easy on the CT guys to advance to the final. However, Kelly Slater, Sebastian Zietz and John John Florence surfed their way into the final – where they came up against local Mason Ho. And while Pipeline had delivered some solid barrels in the first few days, on the final day it was mainly Backdoor that offered scores! In the end it was John John Florence, who won the Pipe Pro with a 9.20 and an 8.43, however Kelly dropped a perfect 10-point ride earlier. Those two are pushing each other to limits not many other surfers can ever reach. It’s just mind-blowing to see them out there at Pipeline having fun when others are scared for their lives. On one day I went to Haleiwa with my most amazing roommate Gina to look for wetsuits and there we convinced each other to finally try the famous Hawaiian “Shaved Ice” from Matsumoto. It’s basically frozen water rasped into a paper cone, which then is topped with colorful syrups of all kinds of different flavors. It looked like a frozen rainbow and actually tasted pretty good (even though I’m pretty sure the syrups had a lot of sugar and artificial E’s in them). Another day, Gina, me and two awesome girls from the Australian Gold Coast went on a hike to the Ma’Akua Gulch on the eastern side of Oahu and it was spectacular! There were so may different trees and views, it was amazing. From dense pine forest to palm trees to trees that looked like they were 100s of years old – from little rivers to stunning mountain ridges all the way to the ocean melting into the horizon. It was a steep and muddy climb at some points, but it was definitely worth the breath! Some days it would be rainy and stormy and we would stay at the Lodge, reading and talking or escaping to a shopping outlet. Other days would be sunny again and we would spend them at some of Hawaii’s beautiful beaches like the Laie Beach Park or sneak into the Waimea Valley Botanical Garden and be amazed by the beautiful trees and flowers as well as the waterfall at the end of the valley. No matter how we would spend our time on the North Shore, it was amazing! And then my time on the North Shore came to an end again. It was hard to say goodbye to my new friend Gina and Bernie, who is the best host I have ever experienced! I will definitely go back and spend more time at this amazing place! But I was also looking forward to Australia, so driving down to Waikiki to spend my last day and night in the States there. Waikiki is a busy tourist place with a lot of hotel highrises along the beach, but I escaped from the hectic with a hike to Diamond Head – a volcanic crater that was used by the military for defense purposes and today offers an amazing view over the southern shores of Oahu. It was quite hot and exhausting to walk up the trail and its steps into the old fort, but once again the view was worth it. 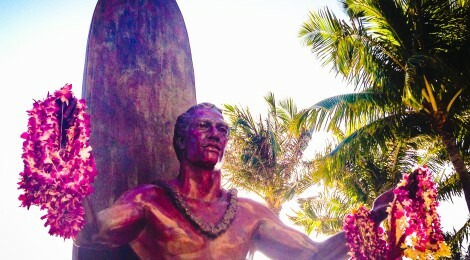 When I got back to the city, I walked along the beach, watched people longboard the small waves that washed ashore and got to see the statue of Duke Kahanamoku. He was an Hawaiian Olympic swimmer. And more importantly, the person that introduced the world to the art of surfing. And for that I will be forever thankful, as I don’t know what my life would look like if I hadn’t discovered this passion that makes me travel around the world, get up early in the morning and meet the most amazing people – in and out of the water. So off I go again, unstuck and heading to Australia, where I will keep following my passion!